As I planned my trip, I was able to add to my itinerary one of the parts of Turkey that I missed on my first trek over — Cappadocia which is also spelled Kapadokya at times. And as friends would ask what I was going to do in Turkey for two weeks, I kept bringing up this place which has been on my must see list for more than a decade. And I kept being surprised by the blank looks I got. Snapped a photo of Kezban on our first overlook of the tour… I had no idea how much I would learn or enjoy getting to know her & the region of Cappadocia. I would try to explain but words weren’t easy to come. It got to the point where I simply pulled up Google Images and let the photos tell a bit of the story. Hopefully now, with having visited and heard parts of the history from my incredible guide Kezban Karatoy, I can tell a bit more about why this place is so special. 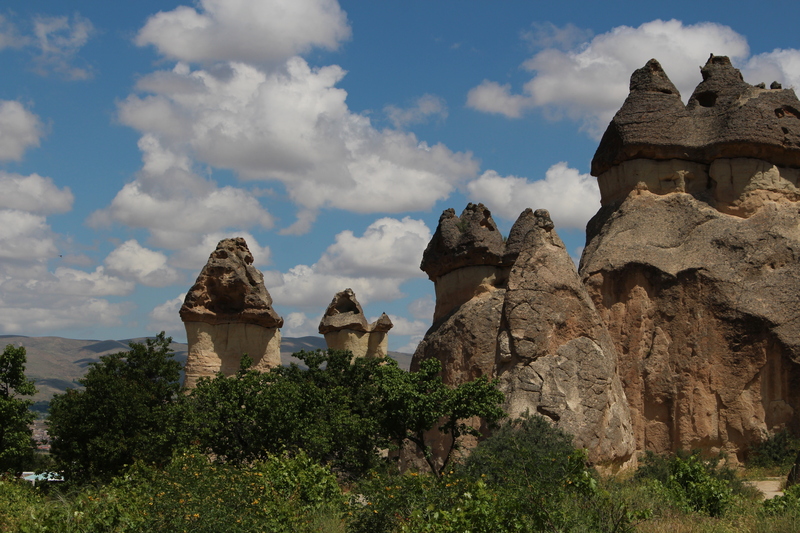 See, the landscape of Cappadocia is unlike anything else on Earth. I don’t say that lightly. In the ways that the Grand Canyon and Sedona are unique, Cappadocia has a similar claim in the hearts and minds of people. But unlike the Grand Canyon & Sedona, human history in this area has been recorded for millennia. It has a place in the earliest sections of history books. One of the things that immediately catches the eye in this area is the stark rock formations and the fact that many have had caves carved into them. The rock here has varying levels of softness and strength so the elements — which seem to go into extreme modes — carve their impacts into the earth. via Hoodoo (geology) – Wikipedia, the free encyclopedia. I loved the way Kezban explained this. The softer rock, once exposed would be vulnerable to the wind, snow, etc and begin to erode. The harder rock, those vulnerable takes longer to see the same amount of change. That softer rock would slowly look like mushroom stems while the harder rock remained bigger and overtime would become more of a mushroom cap. Once erosion does enough damage, the stem will not be able to hold up the top and it will fall to the ground. Add to that the reality that people have been able to use handtools to shape the area further for thousands of years and it really captures the imagination. Another part of the geology & geography that grabbed my attention is the way people find to grow food in the area. 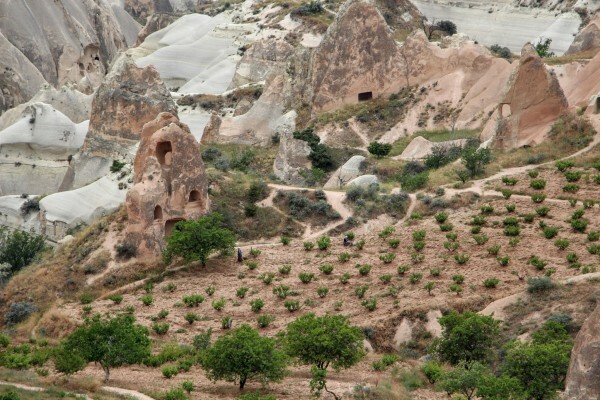 In Cappadocia, I saw more grapes than anything, some tree fruits, some onions and other vegetables, and some wheat. Seeing farms in this area makes me wonder how much change the land and people have seen. On the morning when our tour group went to hike through the Red Valley, I decided to take some time on my own to soak up the place. I wish I could have found my way into this part of the valley to talk to these farmers who were busy working. I booked my travel to & within Cappadocia through Artun Travel in Chicago which also has offices in Turkey and provided fantastic service. Levent was my agent in the US and I had a great contact in Turkey named Vedat who I could text for help with details. The service was incredible and the costs very reasonable. 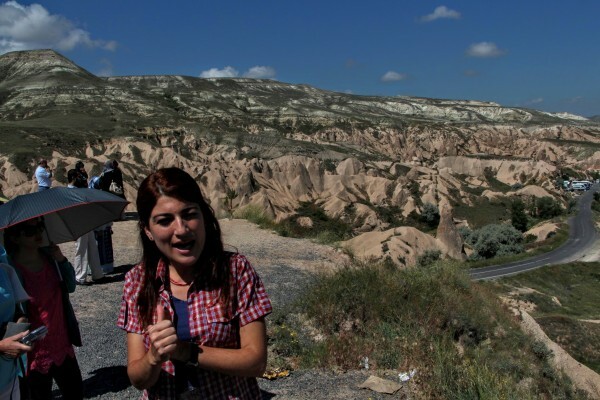 The tour that Artun booked for me was serviced by HTR Turkey Tours for their two days in Cappadocia Tour and while I can’t attest to all of their services, Kezban was truly a fantastic guide for my two days of touring. She kept the conversation and learning going and motivated me to take my fitbit to new heights while getting me to go to great heights and depths in caves! The hotel I stayed in was Selcuklu Evi in Urgup which was quite nice — especially the breakfast and dinner buffets. The owner took an interest in making sure every guest felt welcome and made himself available for any questions, etc. And the wait staff was very helpful and friendly. 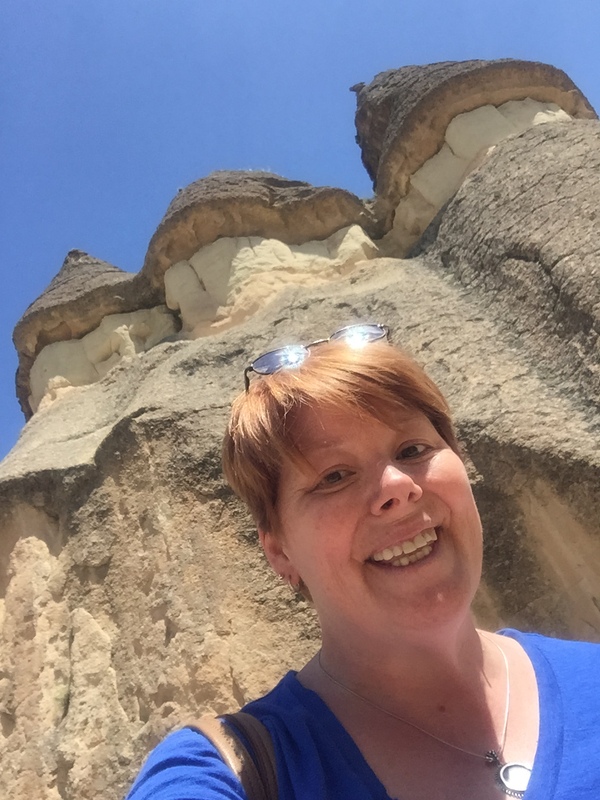 I will be writing a few more posts from my visit in Cappadocia. I hope you enjoy them all as well as the other posts I’m writing about my vacation in Turkey this year!